Hello. 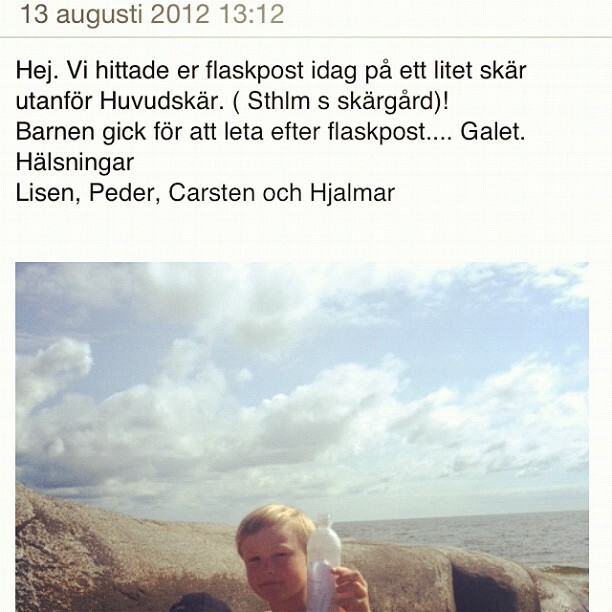 We found your message-in-a-bottle today on a little island off of Huvudskär. (Stockholm’s archipelago)! The kids had gone out to look for messages in bottles… Crazy. The bottle covered a distance of more than 100 miles (160 km) from one place that was in the middle of nowhere to arrive on a tiny island (that is also kind of in the middle of nowhere) to be found by some children who had gone out searching, with the intention of finding a message-in-a-bottle. What’s even crazier is that the day after I posted this photo, my boss came to me flabbergasted, because he knows the family who found it.